Custom Legend Eagle Bowie Knife | BUDK.com - Knives & Swords At The Lowest Prices! Add our Custom Legend Eagle Bowie Knife to your collection today. The wildlife tribute piece features a bald eagle shaped cast metal pommel and the theme is continued on the white handle. 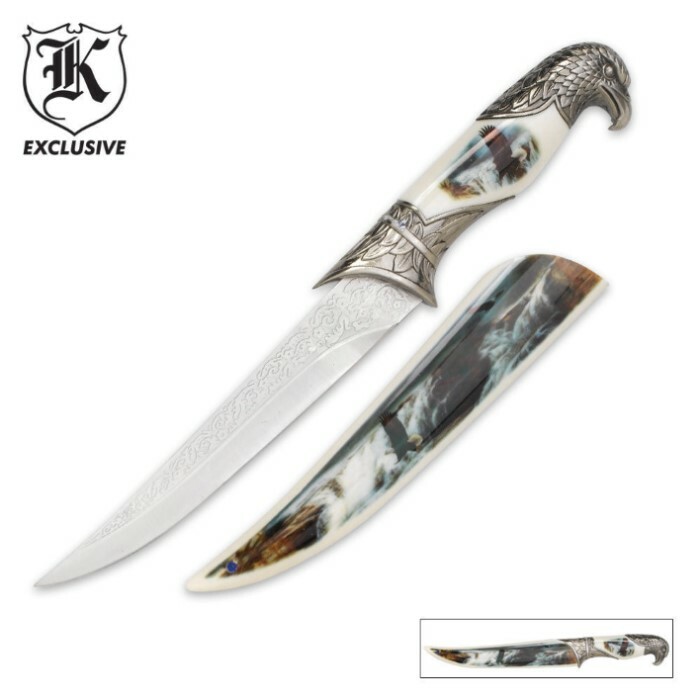 It offers a 7 5/8" stainless steel blade with etched accents. A white sheath with complementary bald eagle artwork houses the blade. This is a nice looking knife for the money. I bought five of these recently for my own use and also to sell. Have already sold three of them and given away one,so I'm about to buy more. Just received nice sharp Better than picture!! can't wait to use it!! Colors great design to fit perfectly in hand. Wish I could wear it on my belt but not to contact to. That seems the only problem I have but just got so will work on how to carry. Any Ideas?? This is about a year after I bought his, it came with the tip completely gone! It still cuts, but it cannot stab and the eagle head came off after a while of usage. Great product! :) gave it as a christmas gift to the weapons collector in my life and he totally loved it! THANK YOU TRUESWORDS!!!! Very cool knife for the price. The handle was a little loose and wobbled when I received it but here is how to fix it if that happens. Heat up the eagle head with a hair dryer to loosen the glue and pull off the head from the plastic. Tighten the nut holding on the blade. Put the head back on, reheat and cool. Good as new. I just got this knife today and its awesome my brother is gonna love his Christmas gift. WHOA!!! this thing is AWESOME!!! highly detailed work, can't believe it's only 7 bucks. the metal is stainless steel but it came really SHARP!!! it cut through paper like butter. No jiggling, firm grip, EXCELLENT craftmanship!! This one has a nice blade but the paint comes off realy easy. For $7 its a realy good buy.